We are introduced to the cast of characters enjoying various activities on their school playground. It is very difficult to “read” gender on the bodies of the joyfully playing children. The children soon decide to work together to “build a house for everyone.” This is accomplished cooperatively and successfully by allowing each child’s unique strengths and passions to guide the project. For instance, tan-skinned Ivy, a young girl with short dark hair is the fastest runner in the group. She runs all around the playground collecting sticks for the house. Ivy’s hair and boyish clothes could mark her as a boy, but she is cisgender even though she does not conform to gender expectations. Another child, the pale-skinned Alex, prefers the pronoun “they” and does not identify as a girl or boy. Sam, a long-haired boy whose black hair contrasts with his light pink-toned skin, collects plants and flowers. He decorates the house, so it will look beautiful. The brown-skinned curly-haired Jackson is a boy who likes to wear dresses. He is very strong and carries heavy rocks to put inside the house to “make comfortable seats for everyone.” Tom, a deep-tan young boy, likes to spell and arranges rocks to create a “welcome” sign in front of the home. When he was born everyone thought he was a girl but now they understand he was always a boy. As these descriptions show, children can explore their full complexity on this very special playground. Gender identity is not tied to gendered affinities for socially prescribed girl and boy clothes, toys, or activities. Ivy, Sam, and Jackson are cisgender, they identify with the gender they were assigned at birth, although they do not conform to gender stereotypes about hair length or activities. The fast Ivy runs all over collecting sticks, the creative Sam decorates their home, and the strong dress-wearing Jackson carried large rocks. Alex, a non-binary child, has an able mind for engineering the building and Tom, a transgender child, enjoys the cerebral world of spelling over collecting materials and building. Refreshingly inclusive, the text offers gender creative, non-binary, and transgender children much needed representations of kids like them. It also provides cisgender students with permission not to conform to stereotypes that would force them to experience and express narrow gender ideals. I love the decision not to include adults, who so often introduce gender policing into children’s lives. 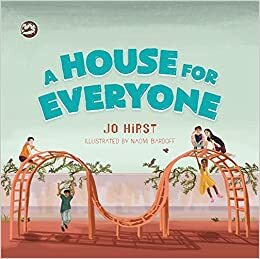 On the playground, this magical in-between place, at school but not in it, after one class, before another, the children in this book have no trouble seeing each other. This is one of the most inclusive picture books about gender identity and expression I have come across and I highly recommend it for school and personal libraries. This can easily be read with children three and up. The author provides a practical resource guide including definitions and discussion prompts for parents and teachers not familiar with terminology introduced. Highly recommended.